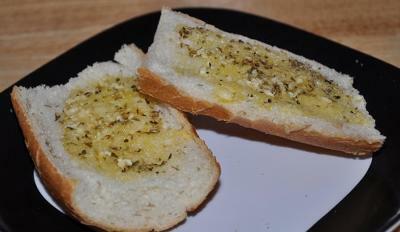 Combine butter with garlic clove. Mix well. Apply this mixture onto the bread slices. Sprinkle salt and oregano on top. Bake in the preheated oven for 5-6 minutes until the bread turns crisp. One of my favorite accompaniments to dinner. I like to add shredded cheese and create a cheese bread that tastes great, too. This also works great for a few days old bread as it doesn't need to be fresh since you are going to toast it.